Over on our sister site – SnapnDeals – we have a great offer running right now – it gets you 30% off Phil Steele’s Headshots and Portraits course. Many of your have taken Phil’s other courses and will be familiar with his helpful videos so will know that he always delivers great training for photographers. 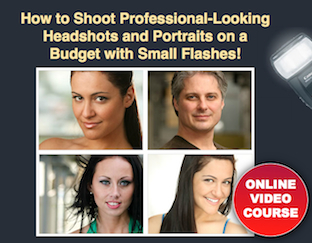 This course will teach you how to take professional looking head shots and portraits on a budget – just using small flashes. Normally the course is $47 but with this Snapn Deal it is just $33. Check out full details of what’s included here. PS: if you’re interested in weekly promotions like this just add your email address to the field below and we’ll send you a weekly update of all new deals. It’s free, we don’t share your details with anyone and you’re welcome to unsubscribe any time if you don’t find the deals to be for you.